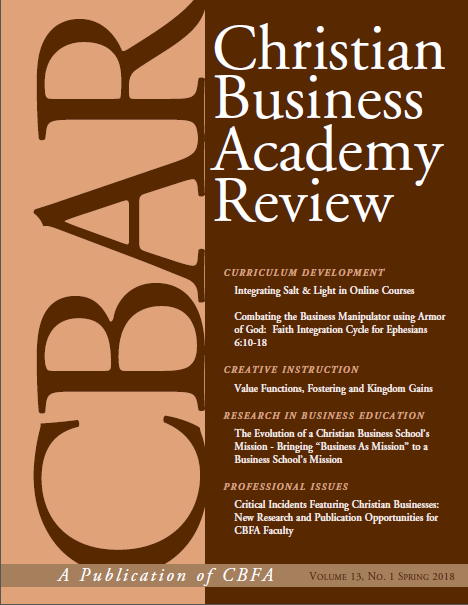 implementing, assessing, and evaluating faith integration in business courses. The paper also demonstrates how faculty—working together—created a multi-disciplinary faith integration effort by providing the theological link between the Bible passage Ephesians 6:10-18 and business disciplines. To assist faculty with faith integration, specific examples of utilizing the FIC are demonstrated with class activities or assignments, including sample syllabus descriptions and grading rubrics. In addition, a general pre- and post-assessment has been provided to assist with the evaluation of the effectiveness of an activity/assignment to achieve faith integration in the classroom. Utilizing the FIC has the potential to be expanded to an entire business program-level faith integration project as suggested by Holder (2006).